The Anderson House holds quite a bit of architectural and historical significance for Pittsburgh, the Manchester neighborhood, and any anyone who has ever borrowed a book from the library. The building is architecturally significant, it was built in 1830 and is one of the oldest buildings in Manchester. This house is also one of the only remaining examples of Greek Revival style architecture in Pittsburgh. Another unusual feature to the Anderson House is the English basement, which is a fancy term for a garden apartment. Architectural history aside, this building has a connection to a current community institution that can be found in neighborhoods across the country today. Colonel Anderson would lend books to a young Pittsburgh boys, including Andrew Carnegie. It was Colonel Anderson’s book lending that inspired Andrew Carnegie to create public libraries. From the Autobiography of Andrew Carnegie, 1920. Colonel James Anderson–I bless his name as I write–announced that he would open his library of four hundred volumes to boys, so that any young man could take out, each Saturday afternoon, a book which could be exchanged for another on the succeeding Saturday. 1919 – Andrew Carnegie dies. 1960s – Anderson Monument was dismantled as part of Urban Redevelopment and creation of Allegheny Center. 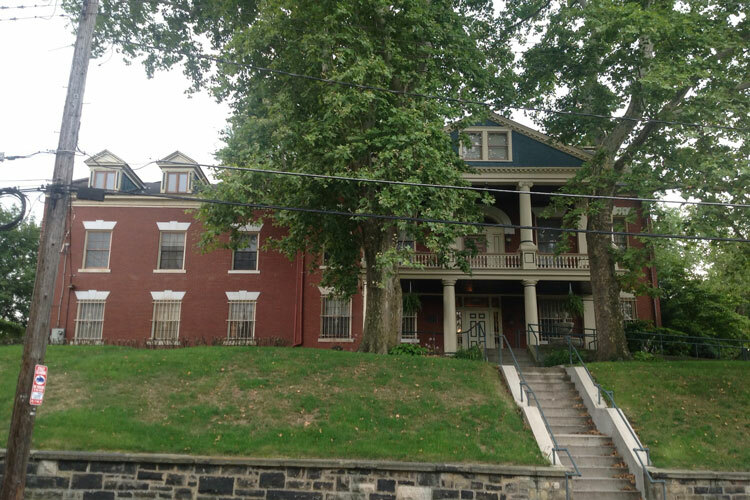 1989 – Anderson House added to Pittsburgh History & Landmarks Historic Landmark’s list. The following photo tour of the Colonel James Anderson House was published on the Post-Gazette website on July, 29, 2016. If the slide show does not load you can view the photos on the Post-Gazette website here. The Anderson House is located at 1423 Liverpool Street in the Manchester neighborhood of Pittsburgh. This Sunday, the Manchester Historic Society has planned a Mother’s Day tea which will be held at a historic mansion in the Manchester neighborhood. Proceeds from the tea will be used in the restoration of the Anderson House. The tea is open to everyone, you don’t have to be a mom or bring your mom to attend, anyone who is interested in history is welcome for tea. Tickets are $45 per person and there will be two seatings, 11am-1pm & 2pm-4pm. Location: The tea will be held in a private mansion in Machester, exact address will be sent to ticket holders.